For the love of garlic. Garlic frying in butter. It announces that something special is taking place in the kitchen. It draws you in, makes your imagination create wonderful possibilities, secret hopes of what the dish might be. It’s the very beginning of something savoury and full of depth and irresistable flavour. Garlic does all of this, and that’s before you even taste it. When my French father-in-law visits, his suitcase is filled with all manner of food delights and this includes the ubiquitous garlic bulbs. They’re three times the size of the puny bulbs available in English supermarkets and their flavour is wonderfully rounded and smooth. If you want quality British garlic, you’ll have to look for it somewhere other than your local, friendly, giant, faceless, monopolizing supermarket. With several bulbs of garlic from southern France, I felt charged with the responsibility of making something worthy of their quality. My first thought was of garlic bread. However, first ideas are not always the best and garlic bread is hardly an earth-shattering revelation. 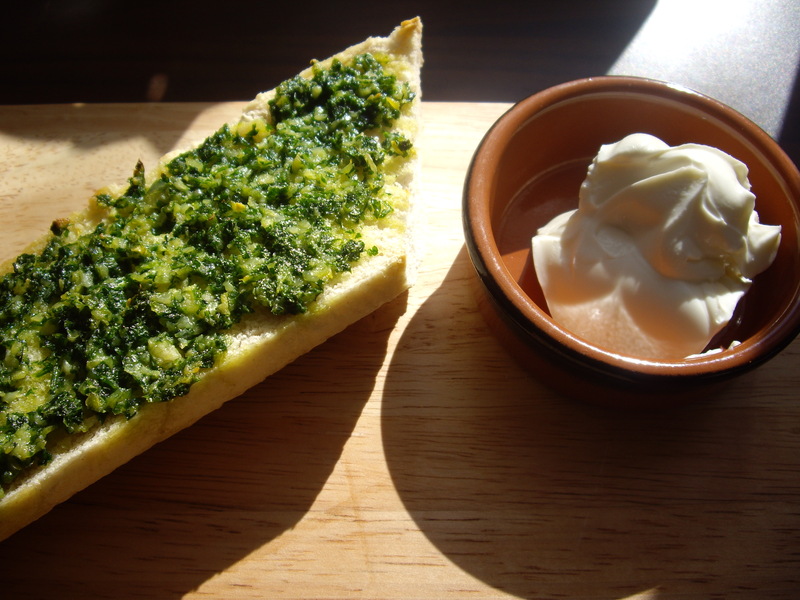 Consulting colleagues didn’t yield any new ideas and I was beginning to scratch my head when suddenly, I had an earth-shattering revelation: garlic bread! You may laugh (and possibly cease reading this altogether), but my first thought was not as silly as I’d judged it to be. What better way to showcase the wonderful flavour of this garlic than to combine it with fairly bland, but satisfying ingredients? I’ve enjoyed garlic soup in the Czech Republic and some wonderful chicken dishes with heaps of garlic in Thailand, but honestly, I wanted something with origins closer to home. What follows is a recipe so full of garlic, that casual admirers of garlic may wish to turn the volume down on this one. My recipe is for those who love garlic, I mean really love it. Can you have too much of a good thing? Probably. It’s a killer garlic bread for a number of reasons. Reading the ingredient list gives you a clue to at least one of them. You can use more or less butter according to your taste (and lifestyle choices). Copious amounts of butter, however, will guarantee a rich flavour and a moist end product. After chopping all of the garlic finely, I heat the butter in a milk pan and fry the pungent cloves very gently. If you burn any of the garlic, it is ruined. The bitter taste of burned garlic is a real spoiler for any dish, so do take care to add enough butter to let the garlic float a little and give the pan a shake to make sure nothing sticks. I often tilt the pan so that the butter gathers and cooks the garlic evenly. I usually add a drop of olive oil to prevent the butter burning too. Don’t add too much oil or you’ll end up with greasy garlic bread which is not pleasant. The reason that I use a lot of butter is not just so that the garlic can be cooked evenly. 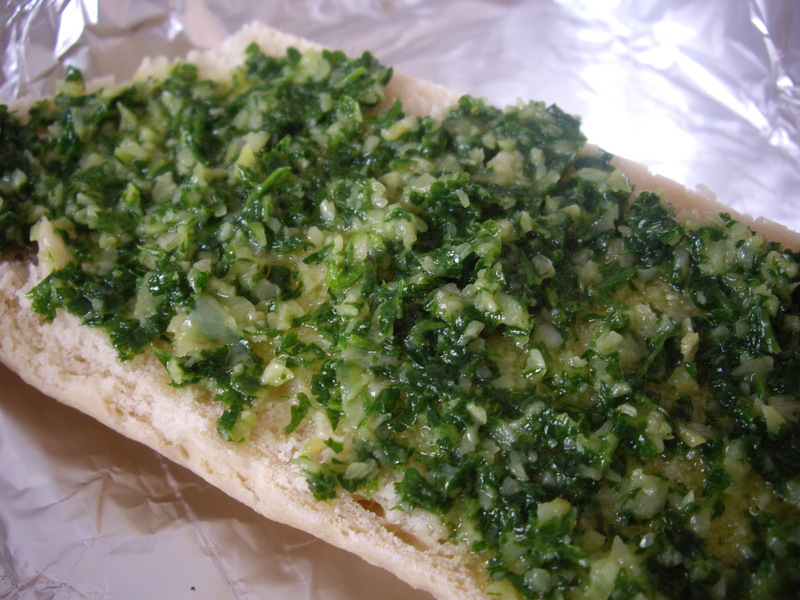 I need to mix the garlic butter with lots of parsley and spread it onto the bread. Predictably, the bread soaks up the liquid, so there needs to be plenty of topping to cover the surface of the bread and also to soak into it. We really want the flavour to seep through instead of sitting on the top. I use a wooden spatula to mix in the parsley and then I season the buttery paste with some sea salt before spooning it onto the bread. Tiger bread is very tasty, so when I spotted a French tiger stick, I was excited about using it to make the garlic bread. You can use a regular baguette for the same result. I only needed half and I cut through the length of the bread and opened it out to spread the verdant garlic butter onto the soft surface. 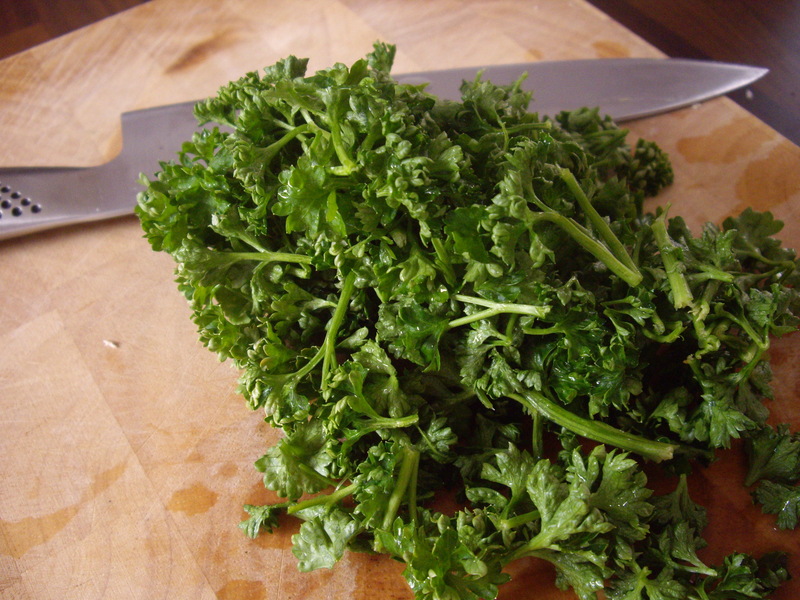 The parsley is essential for countering the strength of the garlic. It also brings a fantastic colour to everything. I left the bread for a few minutes to let the butter soak in. I then lined a baking tin with foil and put the bread into a hot oven at 180C for about ten minutes or until the bread was crisp and golden. 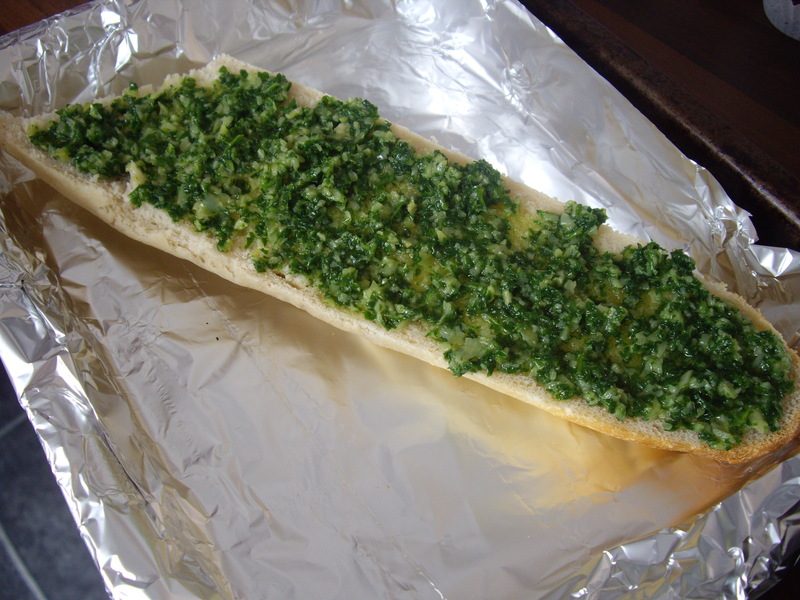 Spreading the butter and parsley to the very edges of the bread ensured that nothing burned. I ate mine with some cream cheese on the side which was a cool companion to every bold bite of this bread. It’s delicious on its own and would go down a treat at a barbecue! Just make sure you warn your friends that this garlic bread is the real deal. 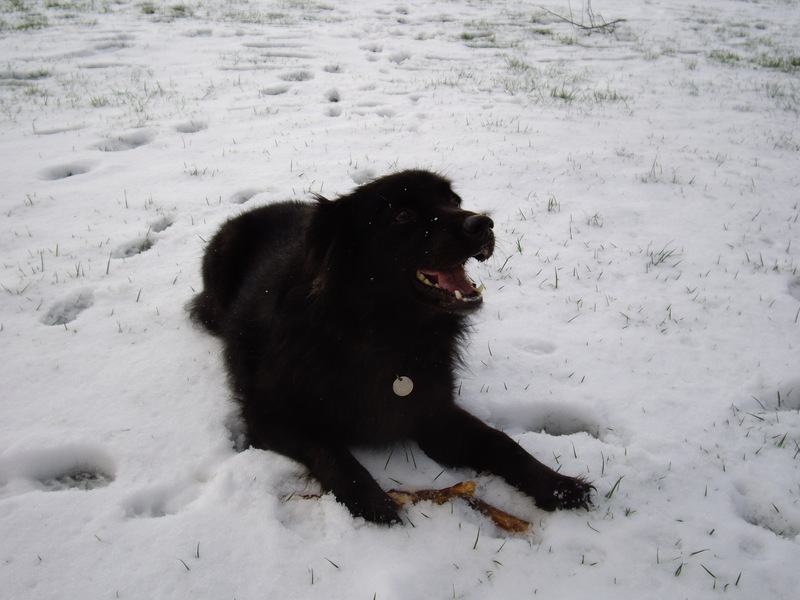 Coco doesn't mind the cold weather. Brrrrr! It hasn’t been too warm recently, but that only serves to fuel my efforts in the kitchen in a bid to warm our bones and lift our spirits. My love of soup is no secret, but with the festive season in full and jolly motion, I couldn’t possibly post a meagre soup recipe and wish you all the best. So, I’ll begin with soup and then move onto some more substantial treats like my tasty terrine and some festive rocky road bars! Yay! I’m sure that if you’re a fan of soup, you’ll have your own winter favourite that springs to mind when thinking of a dark and icy evening. My perfect winter warmer is French onion soup, but it hasn’t always been that way. The very first time I tried French onion soup was not in France. 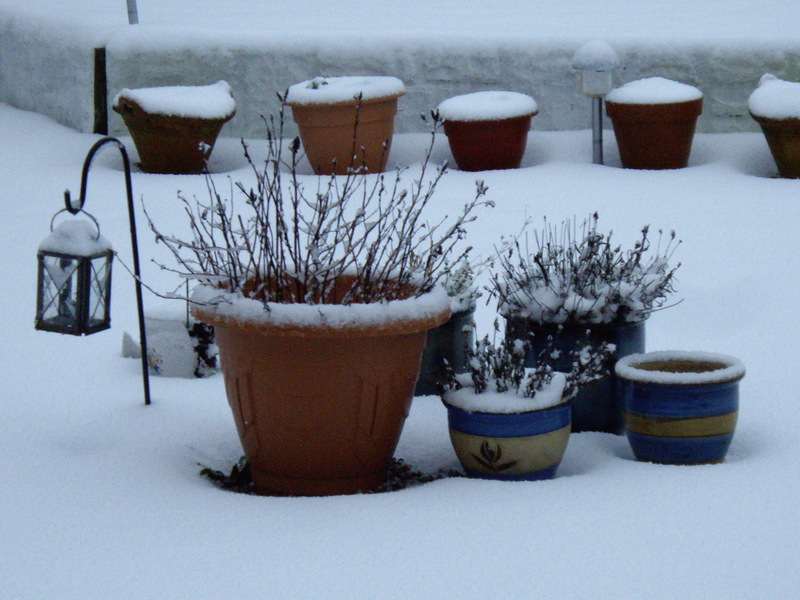 Sadly, no charming tale will follow of soup made by a gentleman in a small French village as the snow gently buried our broken-down car. Instead, a chilly evening in Hong Kong (if such a thing existed), as I gingerly pushed open the door to Jimmy’s Kitchen. The restaurant was dimly lit and the dark wood and old photographs added to the atmosphere. I ordered the onion soup and delighted in the deep, warming flavours. I’ve never looked back. Winter night? Onion soup. Serving the soup is fun if you add a chunk of French bread and melt cheese over everything. This time, I resisted. The following recipe is simple and guaranteed to banish the winter chills. Begin by gently frying the onions in a little butter on the lowest heat. The onions should cook very gently and caramelize. This takes a while and when done, the onions will be brown, but not burned. If the onions begin to burn, turn the heat down and add tiny amounts of water or stock. Next, transfer the onions to the pot that you intend to cook the soup in (if they aren’t in it already). Pour in the stock and the wine and boil rapidly for a minute or two. Reduce the heat and simmer gently for at least fifteen minutes (and up to thirty). Season the soup to taste. I sometimes add sprigs of thyme at this stage for a final flavour. I told you it was simple! As long as you cook the onions for long enough, you’ll have a dark soup with bags of flavour. You can easily make it with fewer onions too. I like a lot. God bless the onion! Tomorrow, festive rocky road bars (with pics, I promise)! Perhaps you’ve noticed the online scramble to get as many tomato recipes posted as possible before summer comes to an end. I know what you’re thinking: Dimitri, you’ve been pouring Cherry Coke on pork, hardly seasonal! Yeah, I know, but it was great, wasn’t it? I mean Cherry Coke and pork; Escoffier would love it, I’m sure. Well, my summers are usually dominated by pizza and anything with plenty of colour. I love tomatoes and will do my best to eat them as often as possible because they’re just so good for you. In the salad I ate tonight, however, they were the least exciting ingredient and that doesn’t happen too often. My wife, N, is of French descent and as such, her love of salad is not a secret. She loves nothing more than a plate of fresh salad to accompany her meals. Her appreciation of a well dressed or carefully prepared salad is something that must be earned. When N compliments me on one of my salads, I feel like I’ve truly achieved something (although I’ve never really achieved anything, so I’m only guessing that it feels that way). 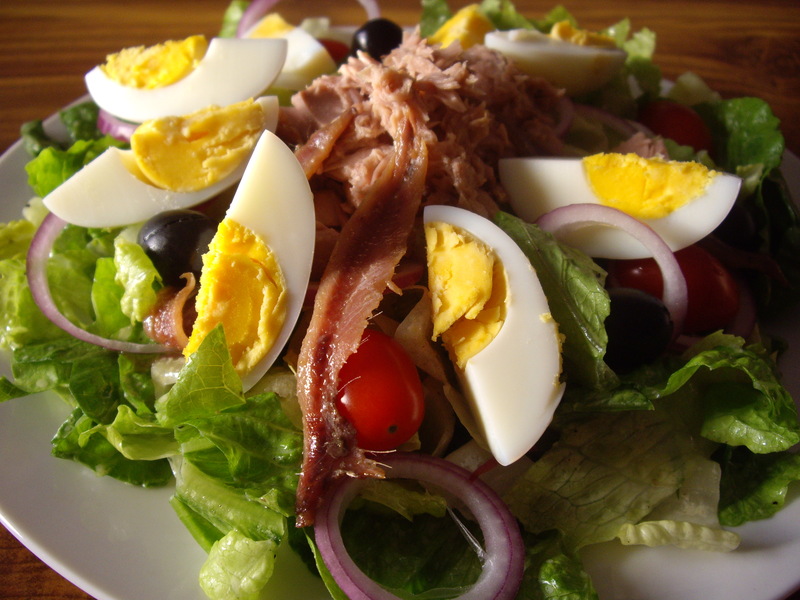 The pick of the bunch is, of course, a good ol’ Nicoise. We both love it because of the tasty balance of flavours. The summer is beginning to fade, but that doesn’t mean we should start on the road to stews and soups just yet. Grab a bunch of ingredients and take some time preparing perhaps the greatest salad of them all. Begin by chopping the onion and placing it in a small bowl of water. Set this aside. The water makes the flavour of the onion milder which is a real boon when eating it raw as in this salad. Chop the lettuce leaves and place in a medium bowl. Make a dressing by whisking together the olive oil, a squeeze of lemon juice and the Dijon mustard. Add the tomatoes to the lettuce, pour over the dressing and toss together. Add the anchovies, tuna, olives and a little black pepper. Drain the water from the onion and sprinkle over the salad. It’s unlikely that you’ll need to add salt because the anchovies act as your seasoning. Toss the salad gently and then place the eggs on top. You could serve the salad as it is, but tonight, we went for the handheld option. I grilled some pitta bread and filled each with the salad. A delightful meal for a summer evening. Take it from someone who is not a big fan of salads, this one is worth the effort. Enter your email address to subscribe to this blog and receive food-filled posts by email! Beef brisket with ginger & spring onions.